In other Sangiovese news, please have a look at the new video by Fattoria dei Barbi owner Stefano Cinelli Colombini on the (short) history of Montalcino. Italian wine trade observers will note a few lacunae and the self-promotion is front and center. But the historic and contextual insight will surely surprise even the most jaded among Italian wine insiders and the production value is excellent (the film was produced by Cricket Productions in the UK). Wine Folly is one of my favorite wine blogs. It’s well written and beautifully composed. Its posts are informed and informative. And its entertaining entries always seem to hit the right balance of neophyte accessibility and street cred. It’s in my Feedly and I often recommend it to newly minted wine lovers who ask me which wine blogs they should follow as they dive into the world of fine wine. When I saw “A Poster Shows What’s Inside Famous Wine Blends” in my Feedly, I was eager to check it out. I remain a loyal fan of Wine Folly and will continue to recommend the site. And I don’t blame the editors for this (sadly egregious) oversight. In my view, the blame lies with a bottlers consortium that creates marketing campaigns like the one above. 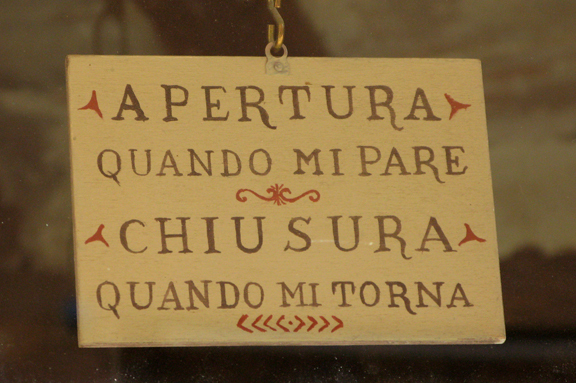 If the ludicrous nature of this campaign isn’t immediately apparent, here’s what a Tuscan wine trade veteran wrote about it on the Italian-language blog Accademia degli Alterati (translation mine). The powers-that-be at the Chianti Classico consortium really need to step up their game and take their marketing seriously. Otherwise, who can blame the editors of a well-intentioned and otherwise well-informed site for such a grave misrepresentation of one of the world’s greatest wines? 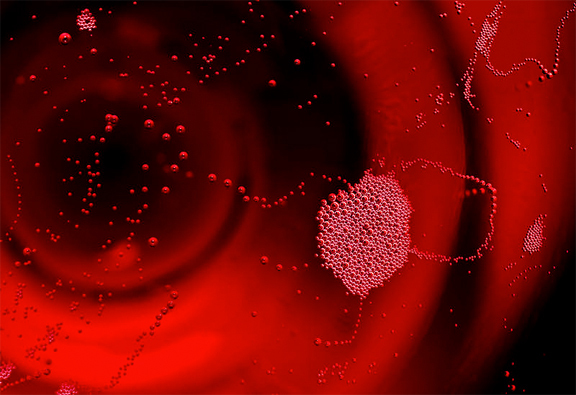 Above: isn’t that a super groovy wine photo? It’s by one of my favorite Texas wine bloggers, OurSommLife. The post was inspired by a recent “live-action” experiment by Columbia University neuroscientist Daniel Salzman. Early Christian philosopher Augustine of Hippo (354-430 C.E.) wrote extensively (and some would say definitively) about this very issue when he described the role of memory in human sensation. He arrived at Salzman’s same conclusion. But that’s neither here nor there. 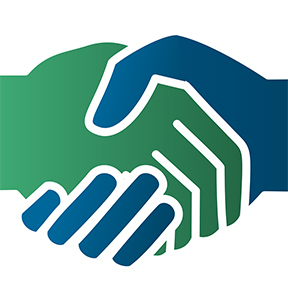 can influence our experience in two interrelated ways. There is the conscious influence, or those things we are knowingly aware of: I’ve had this wine before and liked or hated it; I’ve been to this vineyard; I love this grape; the color reminds me of a wine I had earlier that was delicious. As our experience grows, so do our expectations. Every time we have a wine, we taste everything we know about it and other related wines. Then there are the unconscious factors: the weather is getting on our nerves, or our dining companion is; we’ve loved or hated this restaurant before; I’m mad at my boss over something he said this morning; the music is too loud, and the room is too cold. These can all affect taste, too, even though they are unrelated to the wine itself. The blog post was widely read last week in the U.S. fine wine community and the link found its way to my inbox via more than one e-list and RSS feed. As I read it, I couldn’t help but think about something that American visitors to Italy often tell me: the wine just tasted so much better when I was in Italy. That observation is almost always followed by inquiry: why is that? and do the Italians simply keep the good wines for themselves? The answer to the first question, especially in the light of Konnikova’s experience, is simple. When you’re on vacation in Italy, you’re probably (and hopefully) more relaxed; ideally, you are more well rested; you’re likely sharing the experience with someone you care about and feel close to; you’re surrounded by Italy’s natural and human-made beauty; you might even be getting laid. But there’s an even more important element. In Italy (or France or Spain, for that matter), you’re probably eating more wholesome foods that have been prepared as part of a more balanced diet. 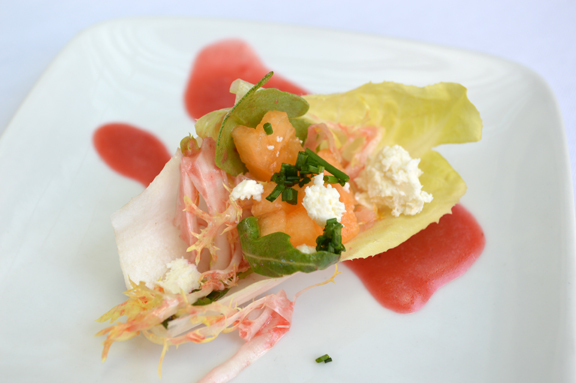 You’re also pairing foods and wines that have been paired together — organically and thoughtfully — for generations. And ultimately, you’re not having a breakfast burrito in the morning, Mongolian beef for lunch, and “Italian” for dinner: if you’re dining well in Europe, you ought to be enjoying meals inspired by local agriculture and local culinary tradition. Now, don’t get me wrong. By no means am I saying that the one or other approach to daily dining is better or worse. Personally, I like it both ways. But the more “holistic” approach that you find at your favorite agritursimo (farm house restaurant/tavern) in Italy does make the wine taste better because the wine is consumed in a more organic (and perhaps more restful) context and environment. The answer to the second question (do the Italians keep the good wine for themselves?) is more complicated. It’s not that they keep the good stuff for themselves (although the Italian wine trade, like that of any nation, including our own, is inevitably driven more by profit than by altruism). 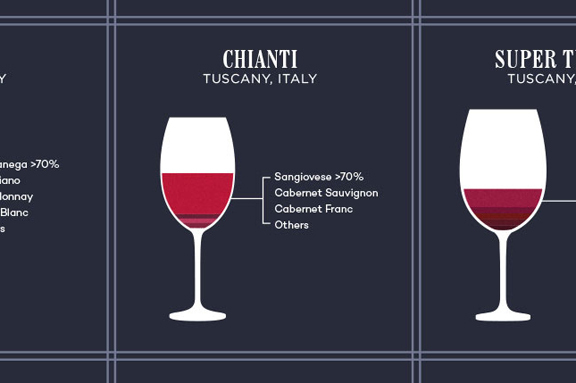 The fact of the matter is that Italians prefer wines with lower alcohol, lighter body, and higher acidity. In enogastronomic context, those wines simply tend to taste better to most people — especially when they are tasted with no pretense or social pressure. Aaaaaaaa… social pressure. Wine is, after all, a social experience (unless you drink alone). If there’s one thing I’d like to impart to readers through my blogging (and I am confident that Master Sommelier and Boulder Wine Merchant owner Brett Zimmerman would agree with me 100 percent), it’s that we should evaluate and appreciate wine within the personal and idiosyncratic context when/where it is tasted. If poolside under the hot Louisiana sun (as I hope to be next weekend), I’d probably give a light bright, 11 percent alcohol Moschofilero from Greece a 90+ score. If celebrating my birthday in the middle of summer (as I always do and recently did do), I’m going to drink a better-suited-for-autumnal-temperatures Barolo (which I did) because by golly, it’s my birthday. Salzman and Konnikova are telling us the same thing that Augustine revealed some 1,600 years ago. And it’s as relevant now as it was then. As you ponder the wine that you will drink with someone you love this weekend, the important thing to remember is that wine is good if it tastes good to you. Taking a short break from the blog next week to celebrate all the Parzen family birthdays that are happening (Lila Jane, Marty, Alfonso, and my own). See you week after next (or before)! 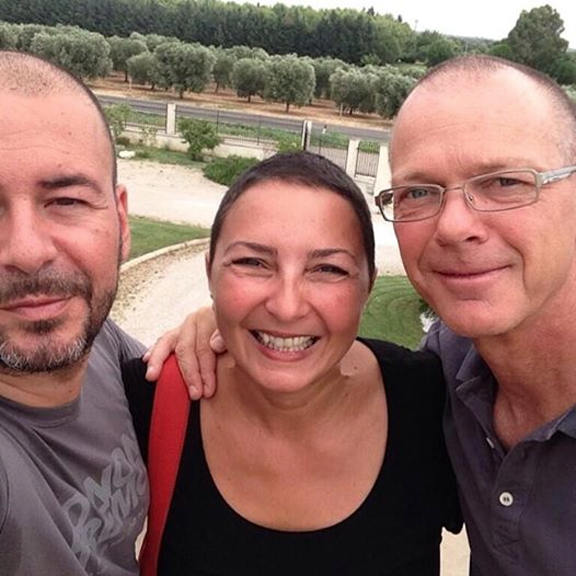 Above, from left: Paolo Cantele, Hande Leimer, and Theodor Leimer, outside the Cantele winery in Guagnano, Lecce province (image via Hande’s Facebook). I had a lot of fun this morning writing this profile of Hande Leimer and her husband Theo for the CanteleUSA blog. If you’re into Italian wine and food, I know you’ll find her posts to be as compelling as I do. Here’s the link. Buona lettura! Word from my agent in LA arrived yesterday afternoon: a song I co-wrote and co-produced, “Sa Sabine,” will appear this Sunday on the pilot for a new show, “The Strain,” written and directed by Guillermo del Toro for FX. 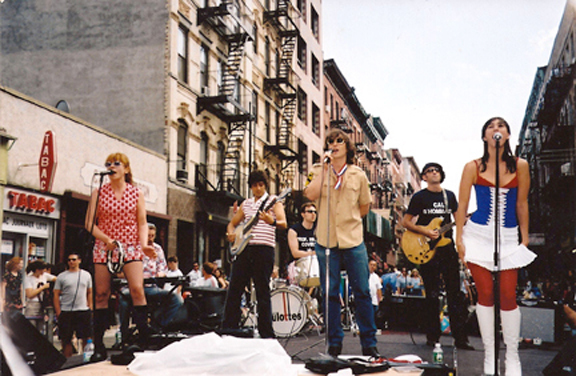 I wrote the music for the song (one of my favorites) back when I was living in Brooklyn and gigging with my then-band, Les Sans Culottes (above). It came out on our album, “Faux Realism,” in 2002 (Aeronaut). At the time, our breakthrough song hadn’t happened yet. In 2003, we sold a song from an earlier recording to a major ad campaign by Hewlett Packard. The spot — played in primetime during the World Series that year and beyond — gave us the bandwidth and exposure that made us a nationally known act. We were a Brooklyn favorite and we headlined regularly at venues like the Bowery Ballroom in Manhattan. It was a crazy and crazy-fun time in my life: I had been working in New York as a freelance writer and copywriter for a few years by then and I was writing, playing, and recording music by night (and not just with the French band). I can’t share the song here because of copyright issues. But if you want to check out the original recording (which was made on two-inch tape — yes! — in a studio in pre-gentrification Bushwick), you’ll find it on all the usual platforms (iTunes, Amazon, etc.). After we made an initial mix of the track, we played part of it back slightly out of sync with the original, thus creating a “phaser” effect that gives that section of the song an otherworldly sound (otherwise known as the “spaceship” or “doobie” effect). I make a decent living by writing about Italian gastronomy and culture and have nothing to complain about. Life’s been good to me so far (je suis j’étais un rock star). But selling one of my songs and knowing that my music is still out there is one of the greatest rewards of my professional life. The pilot for “The Strain” airs Sunday night at 10 p.m. EST on FX. 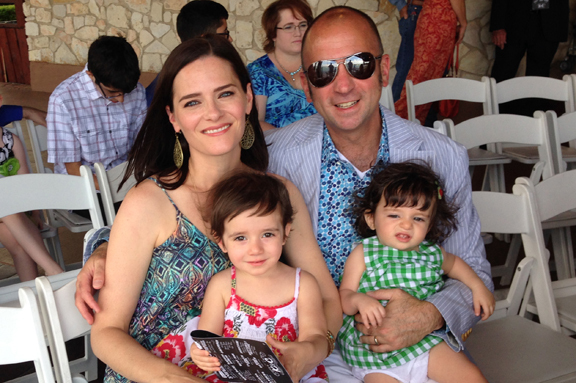 The Parzen family attended a cousin’s wedding over the weekend at Lake Travis outside of Austin (mazel tov, Katherine and Clark!) and uncle Terry snapped this photo of me and the girls. But the big Parzen family news is that Lila Jane is starting to sit up on her own! She will be one year old in just over a week and she and I will be celebrating our birthdays together. I love being a dad so much. And every day I love my gorgeous Tracie P more and more for giving us such beautiful, happy girls and for being such a great mom to them. Thanks for sharing our joy. Above: after our tasting, team sparkling wine had lunch with winemaker Craig Camp at Hurley’s in Yountville across the street from the Cornerstone Cellars tasting room. Even at a toned-down Americana restaurant like Hurley’s, the food is so thoughtful, wholesome, and delicious. That’s the amuse bouche. I’ll never forget the first time I poured a Napa wine for an Italian wine connoisseur. The year was 1990 and my friend Riccardo Marcucci from Bagno Vignoni in Montalcino had come to visit me in Southern California. When he asked me to pour him a Californian wine, I reached for a bottle of Robert Mondavi Reserve Cabernet Sauvignon. He tasted the wine and laughed. There were so many layers of irony in his hubris, especially in the light of the California-style wines that he liked so much, that I simply ascribed it to his Tuscan machoism. 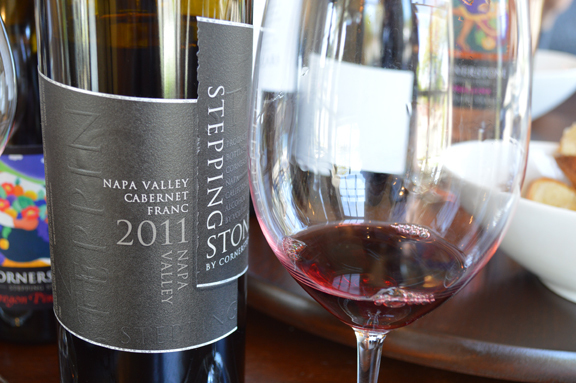 Above: the 2011 Cornerstone Napa Valley Cabernet Franc is one of the best wines I’ve ever tasted from Napa. It had vibrant acidity, clarity of fruit, genuine varietal expression and lovely freshness and drinkability. I loved this wine and can actually afford it. The last stop on my recent tour of California wineries with team sparkling wine from Italy was at the Cornerstone Cellars tasting room in Yountville, Napa, where we tasted a fantastic flight of wines with winemaker and blogger Craig Camp. It gave me immense pleasure to watch the Italian winemakers ooo and aaa over these wines. Craig, who’s been a wine blogging colleague and friend of mine for many years now, has such a deft hand in interpreting Californian fruit. The “red thread” of his style is high acidity and restrained alcohol — the hallmarks of food-friendliness. And the wines are moderately priced for their value and quality. The standouts for me were the 2011 Napa Cabernet Franc and the 2010 Willamette Pinot Noir, which really knocked me off my feet. I also really loved the 2011 Napa Sauvignon Blanc. It had just the right amount of cat piss on the nose and its aromatic profile complemented the elegant white and tropical fruit on the palate. Delicious, happy wines, all around. But the thing that gave me the greatest satisfaction was watching the Italians wrap their minds around a “Napa” they hadn’t dreamed could exist. Above: me (far left) with team sparkling wine, from left, Giovanni Arcari, Andrea Rudelli, and Nico Danesi (photo by VinoGirl). For Italian readers, check out Giovanni’s post here. English speakers shouldn’t miss Alder Yarrow’s recent profile of Craig on Vinography. And I also recommend reading Craig’s recent post, Dancing with Wine. In his thoughtful reflections on trends in fine wine today, he reminds us that deliciousness trumps profundity when it comes to sitting down for dinner with friends and sharing a great bottle. 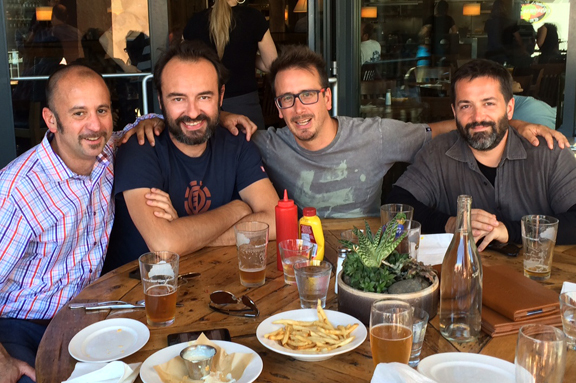 It’s never easy to take Italians to California wine country. As the saying goes, you can take Italians out of Italy but you can’t take the Italy out of Italians. We tasted scores of wines on our trip and they were impressed by some and not as much by others. I’d like to think that on this last day of our trip, abbiamo finito in bellezza… we ended on a high note. Mention to nearly anyone in the wine business that you’re heading to Las Vegas and she/he will invariably tell you that you must visit the Lotus of Siam, an otherwise unassuming Thai restaurant with a phenomenal Riesling-heavy list. I’m not a gambler but my band has played Vegas a handful of times. 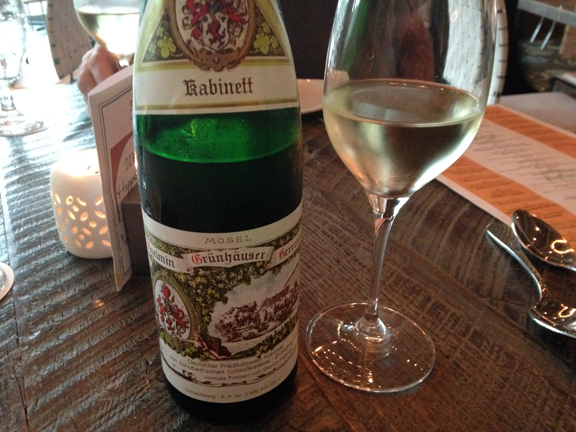 And each time I’ve visited, I’ve been thrilled by the pairing of Riesling and the spicy flavors of the restaurant’s menu (and it’s actually the only place in Vegas, in my experience, where I can afford to get an interesting and satisfying meal). I couldn’t help but be reminded of the Lotus of Siam when I visited Caracol in Houston with a buddy on Thursday night. The match of conch ceviche (in the top photo; one of the restaurant’s de facto signature dishes) and the 2011 Grünhaus Herrenberg Kabinett was simply one of the most brilliant marriages of aroma, flavor, and texture that I’ve experienced this year. The wine, however youthful, was so pure in its white fruit notes and its elegant sweetness and delicate unctuousness played counterpoint to the measured acidity and supple chewiness of the thinly sliced conch. Of course, I can never resist the tlacoyo de alberjón (above), a blue masa de maíz flatbread stuffed with puréed chickpeas (and another of the restaurant’s signature dishes). 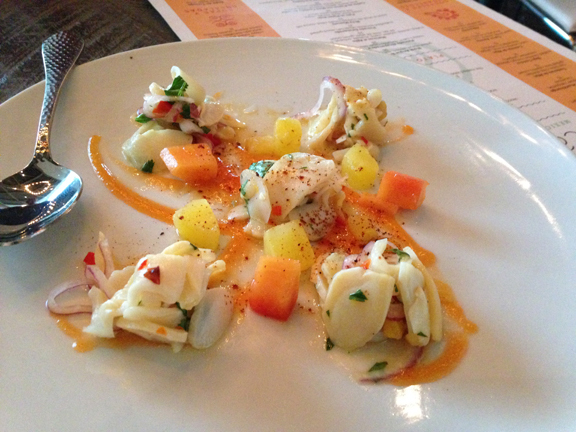 My friend and leading Houston sommelier Sean Beck has put together a superb list of German-speaking wines at this “Mexican seafood” concept by Houston legacy chef Hugo Ortega. 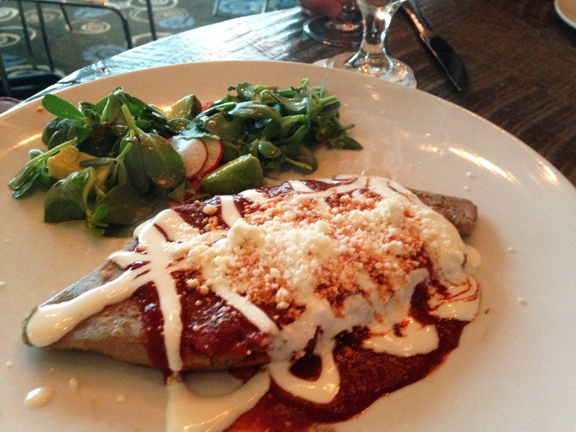 I love LOVE this restaurant and it’s a place where Spanish is spoken in a spectrum of cadences that stretch from South to Central America by guests and staff alike, a perfect example of Houston’s cosmopolitan vibe and one of the reasons I love living here. Happy Fourth of July, yall! This July is such a special month for us: we will be celebrating Lila Jane’s first birthday! She and I are planning to celebrate together because our birthdays are just eight days apart. 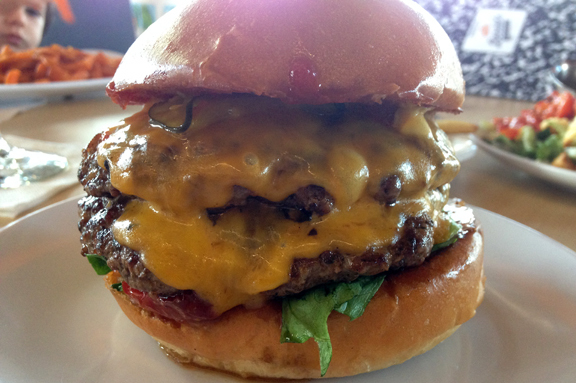 Yesterday, I took the girls to the newly opened Bernie’s Burger Bus here in Houston. It’s one of the city’s most popular food trucks and has finally opened a stand-alone location. It’s pretty cool: the open kitchen is in a life-size yellow school bus right in the middle of the restaurant. And it’s not far from our house so I imagine we’ll be spending a lot of time there this summer. The girls loved it, especially the sweet potato fries, as you can see by Lila Jane’s impression of the Incredible Hulk. 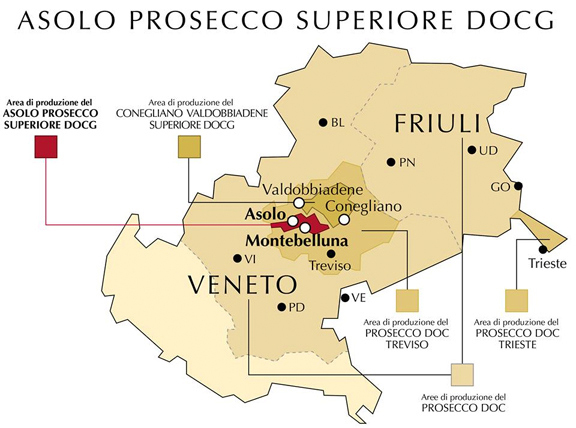 Above: Valdobbiadene, Conegliano, and Asolo are the three historic townships of Prosecco. Today, it’s increasingly challenging for Prosecco DOCG growers to compete with the DOC growers and bottlers in the planes of the Veneto and Friuli, where growing costs are significantly lower. —Matteo Lunelli, Cantine Ferrari president and 50-percent stakeholder in the historic Prosecco house Bisol. Please click here to read my Prosecco editorial for the Bele Casel blog.